The TRC 472FG resembles the inside of a Cessna 172 exactly. All inside measurments are exactly the same as in a real Cessna 172. This makes the TRC 472FG flight simulator not only a perfect training device, but also the best procedure training aid available. The TRC 472FG Flight System is a full replica of a Cessna 172NG. It comes with real replicated instruments, instead of projected instruments behind a panel with just some holes. Even the G1000 units work exactly like the real Garmin G1000. It is very difficult to tell the difference between the inside of a real Cessna 172 and the inside of the TRC 472FG Static Flight Simulator. 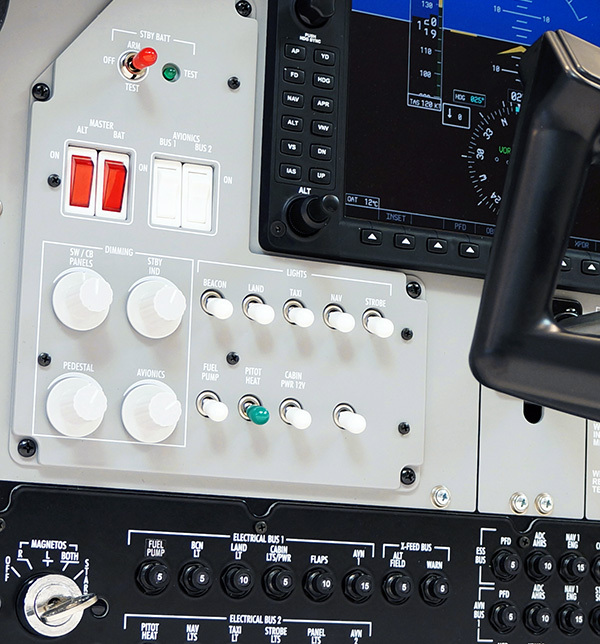 When entering the TRC 472FG flight simulator, the student will step into an actual aircraft, with all instruments, knobs and controls on the location where you should expect them, instead of a generic cockpit with a panel that doesn’t resemble an actual plane. The resemblance between the real aircraft and the TRC 472FG is so striking, that you can hardly tell the difference between the both of them. 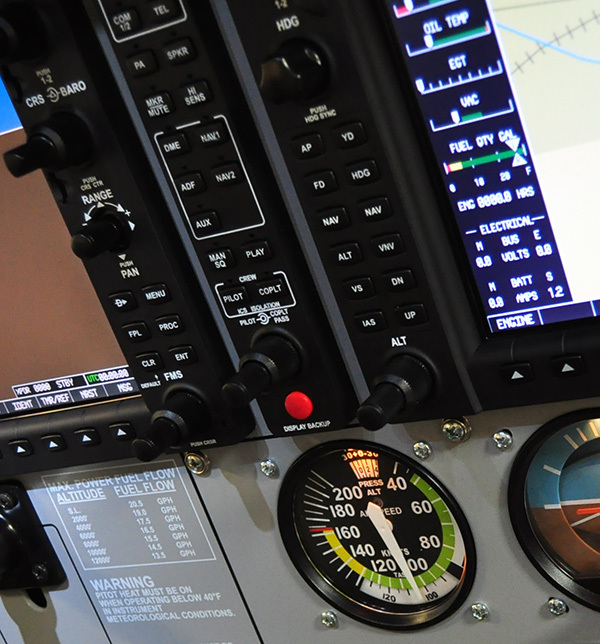 Instead of making use of LCD screens to project the instruments behind holes in a panel, the TRC 472FG flight simulator contains real instruments that behave and can be controlled exactly like in the real aircraft. The TRC 472FG flight simulator system teaches the student to operate an aircraft, rather than a flight simulator. The TRC 472FG Fixed Base Flight Simulator comes as a complete package, so you are ready to start educating your students. Everything is included, from a 180 degree HD visual system for an immersive view directly from your cockpit, to an instructor station desk, including software to keep track of the progress of your students. The panel of the TRC 472FG Fixed Base Flight Simulator is exactly the same as the panel of the TRC 472G Flight Deck. The spring loaded (up to EASA FNPT I requirements) dual yoke and rudder pedals can be upgraded with control loaded dual yoke and dual rudder pedals (up to EASA FNPT II requirements). The TRC472FG Flight Simulator cabin looks and feels like an actual aircraft. All dimensions, including the location of the instruments on the panel, are exactly like a real Cessna 172. This also makes it a perfect procedure trainer. The TRC 180 Visual System has a FOV of 180 degrees and is made out of high quality materials that will enhance the immersive experience and let the user believe he is in control of an actual airplane. The system comes three full HD Short Throw projectors with 2.800 ANSI-lumen brightness and a contrast ratio of 25.000 : 1. The screen material is projection cloth with a high reflectance value. 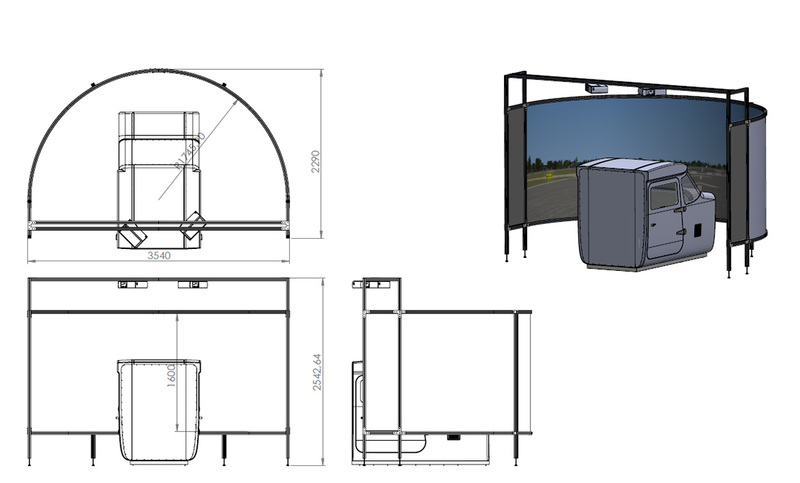 The instructor station desk, including 2 monitors will give you full control of the TRC 472FA Static Flight Simulator. 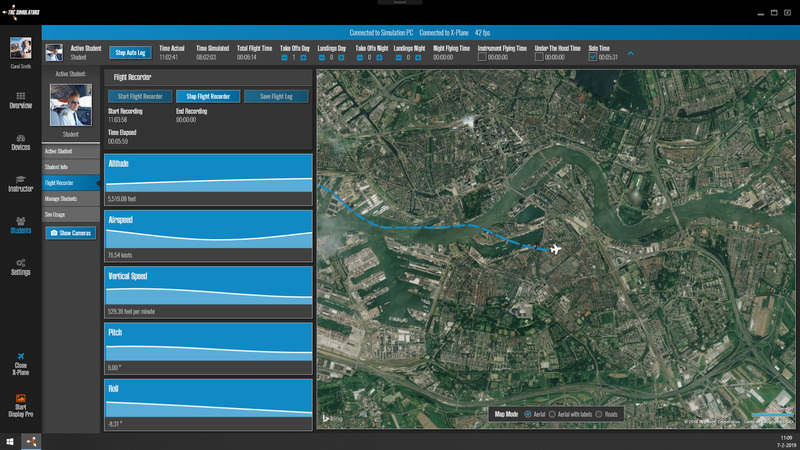 You can control the aircraft, the weather, the position of the aircraft, engine failures and much more. It is also possible to keep track of the progress of your students using our own instructor software that is included in the package. The TRC 472FA Flight Simulator comes with a high-end computer system to run the flight simulator software. The system is built with the latest specification processor, graphic card, memory and solid state disc. An instructor station computer is also included. 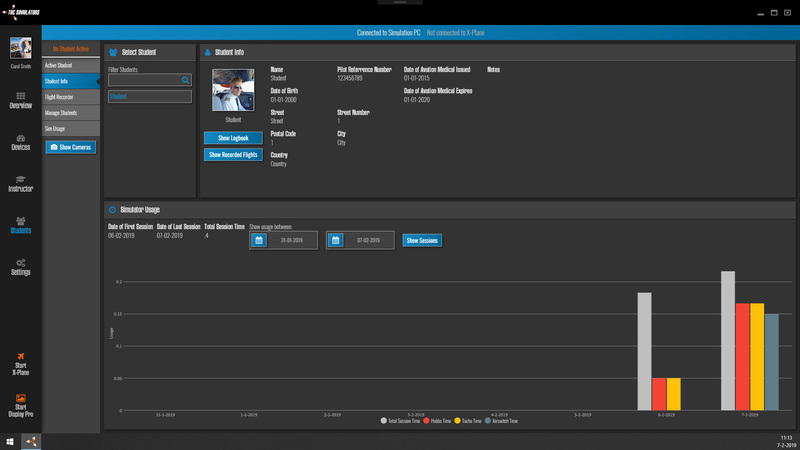 In addition to the standard instructor station software, the system also comes with our own instructor software to keep track of the progress of your students. The TRC Simulators model TRC472FG is based on the dimensions and layout of a Cessna 172 production single engine aircraft. This closely represents the overall functionality, performance, avionics, and instrumentation. The platform consists of a cockpit section, instructor’s control station, visual display system and an audio system. It incorporates a combination of hardware and software components that is assembled and checked by TRC Simulators. All hardware elements are permanently installed and designed so the cockpit has the appearance and feel of an actual aircraft. From the pilot’s seated position, there are no computer hardware elements such as keyboards, pointing devices, etc. for his or her use. The 180 degrees wrap around visual system with three short throw Full HD projectors creates an almost 3 dimensional immersive view that let you believe the device is on a motion platform. While the TRC 472FG comes with a 180 degrees visual system with three HD projectors, the setup, is still very compact. The TRC 472FG flight simulator system comes with a fully equipped instructor station. 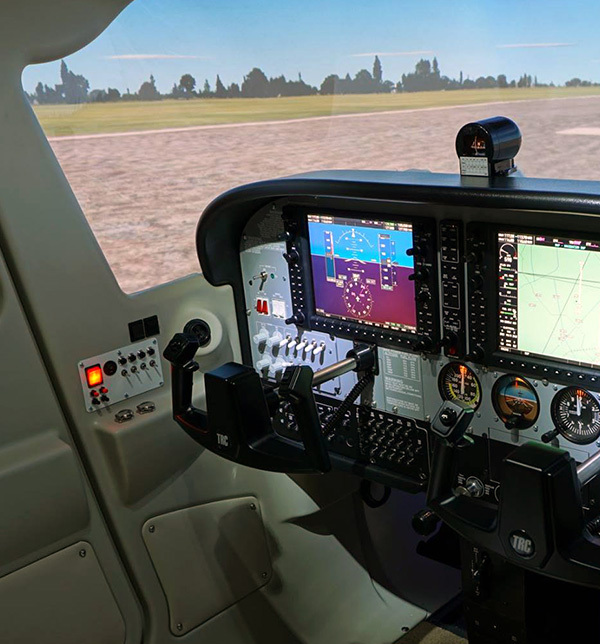 This instructor station makes if extremely easy for the instructor to control the simulation’s environment, change the weather, reposition the student’s aircraft, and trigger malfunctions in real time as the simulation is running. 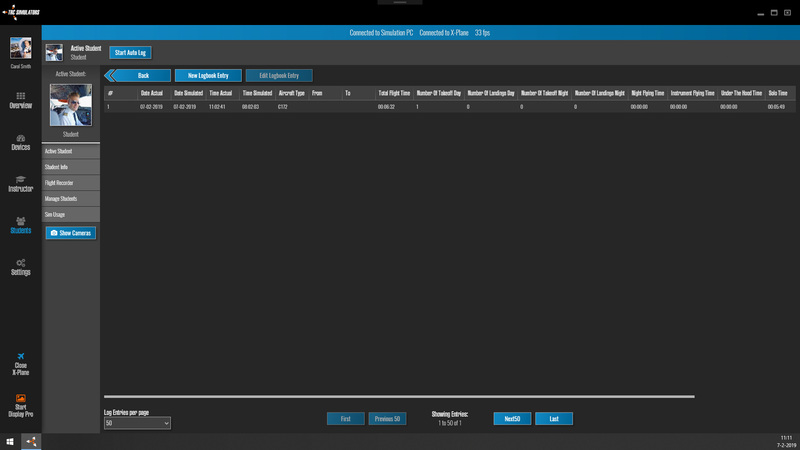 It gives professional-quality tools for monitoring, instruction, and analysis. 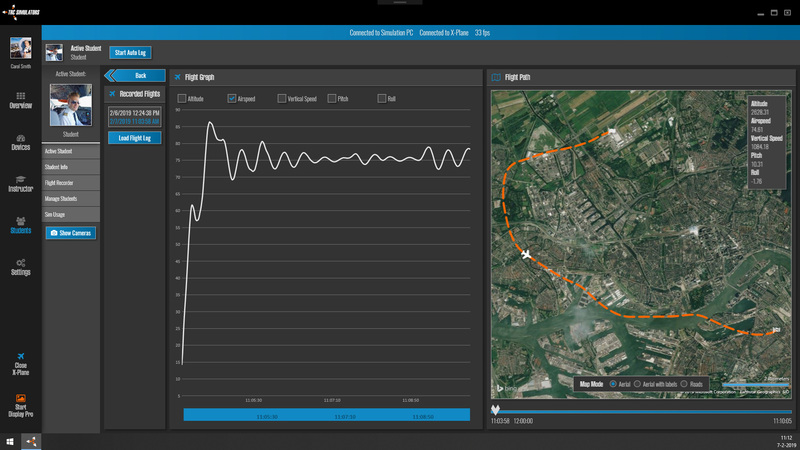 The possibility to record the current flight, makes it very easy for the instructor to review the flight with the student and discuss what he is doing right or wrong. Because of the compact size of the TRC 472FG flight simulator, it will fit in any standard office environment and there is no need for a special air conditioning system, as the complete system has a relatively low power consumption. One 110/220v power socket will do for the complete system. 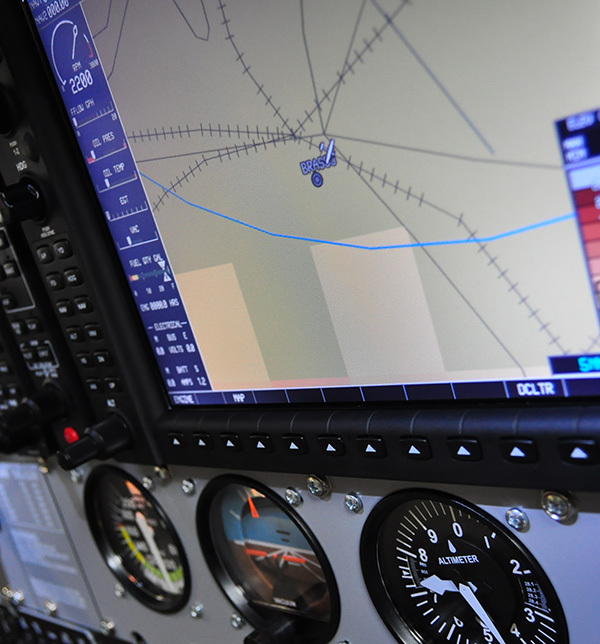 You don’t need to change your electrical infrastructure, just for one flight simulator system. High fidelity control loaded dual yoke and dual rudder pedals system for most realistic flight experience. Simulated effects: engine, ground, turbulence, real trim, autopilot, stall etc. Real-time synchronization logic for dual-pilot cockpit with automatic pilot/co-pilot take-over. In this video you can see the TRC 472FG Fixed Base Glass Cockpit Flight Simulator in action. It will give you an idea of the exact dimensions of the complete system. The system as shown in the video runs on Lockheed Martin Prepar3D with Flight1 Aviation Technologies G1000 and instructor station software, but it can also be built specifically for X-Plane 11 Pro, including FS Flight Control Instructor Station software. The TRC 472FG Flight Simulator does not only come with Instructor Station software to control the aircraft, the weather, the position of the aircraft, engine failures and much more. It also comes with our own Instructor suite to control the gauges and instruments, but also to keep track of the progress of your students, including recorded flight, log books and much more to discuss the training progress with your students.